Today’s session was more of a research training, as none of the metal or soft Bou-shuriken were used. After watching the Meifu Shinkage-ryû dvd, training commenced on proper kamae, Gedan no Kamae, Chudan no Kamae, and Jodan no Kamae, as well as practicing foot work. After that, we did some practicing with Shomen-uchi, using Ohashi and a polystyrene target. That was a lot of fun, and something we will be doing during the sessions coming Monday and Tuesday. Many start martial arts training just to learn how to kick or to punch. Others start because they are wanting to learn something that the mainstream is not interested in. This post is a personal reflection on why I choose to become a student of Meifu Shinkage-ryu. Budo as I feel it has a hard and soft side. This reflection is about the soft side. It started in 1984, after having watched an episode of The Master with Lee van Cleef. I had already been exposed to Judo and had a few years of training experience with Judo under the local Judo Sensei in Amsterdam (The Netherlands) who taught a kids group once per week. My friend and I were kicked out of the club after my friend’s dad made a scene at one of the grading sessions for one of the kyu ranks we had hoped to pass. I think I was 8 years old at that time. Then I joined a small karate school (I cannot remember the name), but I remember the training sessions as tough, even for kids. My memory of training at that dojo are vague but I remember one person who was training at there diligently. A few years later, I after I joined another budo dojo, I remembered the face of the sensei at the school. He was the same person who I had seen at the previous dojo. He had started his own dojo, focusing on budo as a way of life rather than a sport. I joined his dojo and went there every evening to learn. One of my judo friends also joined. This training was different. We learned how to roll and fall, learned how to use our body to move even before an opponent would make his move, and were taught locks and holds that were different from the ones I learned at Judo. We also spent time learning what I thought was Kobudo, as well as Kata I had never heard of. One day, and years later, I asked my Sensei about the TV series The Master. He laughed and said that everything in that show was fiction. But I did not believe that and started to do some research. I visited a small book store in Downtown Amsterdam, which was famous for their collection of Asian books. I asked the owner if he had any books on Japanese martial arts and was pointed to a book case. Two of the books I came across were about a word I had heard in The Master TV show Shuriken. I bought these two books (in German language) and read as much as I could. Of course then I wanted to get my hands on some shuriken, so I went to one of the local martial arts stores. The sales person told me he had some shuriken in stock but that they would soon become prohibited due to a new law being implemented. Nevertheless, I bought the cheapest versions I could afford: one spike shaped shuriken, and one “star” shaped shuriken marked with “Made in Taiwan”. Seeing my interest, he gave me something else as well: a pouch with three black spikes, each about 15 centimetres long. Going through the German books, I could not find much information on those spikes, but feeling the difference between the star shuriken (hira-shuriken) and spikes (bou-shuriken), I had a feeling that the bou-shuriken were much better than the star-shaped one. The next day, I went back to the martial arts store, and the person behind the counter told me to come back the next day if I wanted to learn something about the spikes. I did, and met an aiki-jutsu sensei, who asked about my interest in bou-shuriken. After explaining to him what my interest was he told me he could tell me more if I were to come train at his dojo. That was the start of getting some formal instruction in aiki-jutsu, and also shuriken-jutsu as sensei called it. After a while, I was forced to make a choice between karate-jutsu and further training aiki-jutsu due to priorities at high school. I decided to continue training karate-jutsu with some of my friends and left the small aiki-jutsu dojo, taking with me a small amount of instruction in shuriken-jutsu. I did not know what school or style sensei taught, I only know that he used spikes similar to the ones I was given. About 15 years later, I met the aiki-jutsu sensei again when I visit a different dojo. This was shortly before I moved to Canada. We shared pleasurable memories of when sensei still had his own dojo with only 15 members. Unknowing if I could bring the bou-shuriken to Canada, I gave them to sensei with the message to please give them to another budoka who might not be able to buy his own set. 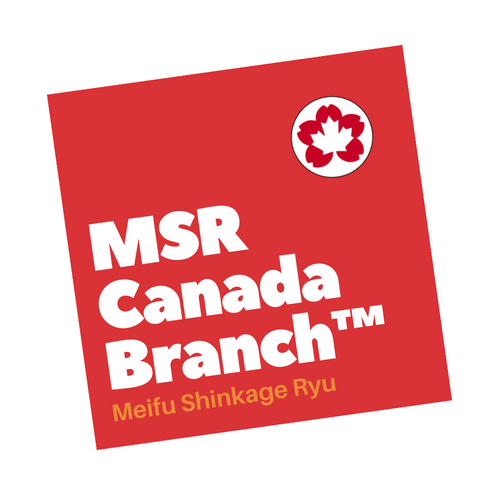 After having lived almost 8 years in Canada, I decided to pick up formal instruction in shuriken-jutsu by inviting Otsuka Sensei from Meifu Shinkage-ryu to Canada, and to La Ronge of all places. It feels as a reset of 15 years ago, but now with a tremendous opportunity to pass on the knowledge to my own son when the time for that has come. This time I can pursue it to the fullest. Today was a session by myself, doing some technical training as preparation for Tuesday’s session. I focused on Shomenuchi only. The first exercise was to determine the angle of the shuriken after each throw. For that, I used a diagram out of Shirakami Ikku-Ken Sensei book Shuriken-Do (page 88). When pulling the shuriken out of the puzzle mat, I also took note of how the shuriken had entered the target by looking at the angle of the cut in the mat. I also use an iPad to record a few series of 5 throws. I then played this video frame by frame to determine the flight path of each shuriken. A bit difficult to see, but some fantastic information can be learned from looking at such footage. The second exercise focused on precision. I remembered playing a game with darts when I was a teenager and wanted to replicate it for shuriken. I drew a grid on one puzzle mat consisting of 16 squares. I gave each square a number. The focus was on aiming for squares in sequence. Shuriken 1 in square 1, shuriken 2 in square 2, et caetera. Although it seems easy, it was not. Taking time to aim and using proper breathing helped in hitting the desired squares around 50% of hits. This is something I would like to do during our next session on Tuesday. Training today: – Darren and Chris. Today’s session ran around 3 hours of intense focus, practicing shomenuchi only, in addition to a lot of budo talk. This session, we focused on relaxation, taking the time to setup each throw, execute it properly with flow and correct arm movement, hip rotation, and step, and taking enough time… whenever a thought slipped into our minds, we stopped, and reset our technique. This resulted in quite some progress from the beginning of the session to the end of the session, especially in allowing to step away from hectic everyday life while observing the beauty of a well executed throw.